Social-emotional health: look to ASQ:SE-2 for truly accurate screening. Early identification of social-emotional challenges can make all the difference to a young child. The proof is undeniable: the earlier a behavioral concern is identified, the greater the chance a child has for reaching his or her full potential in life. 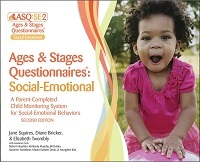 This is the driving force behind Ages & Stages Questionnaires®: Social-Emotional, Second Edition (ASQ®:SE-2)—a parent-completed, highly reliable system focused solely on social and emotional development in young children. 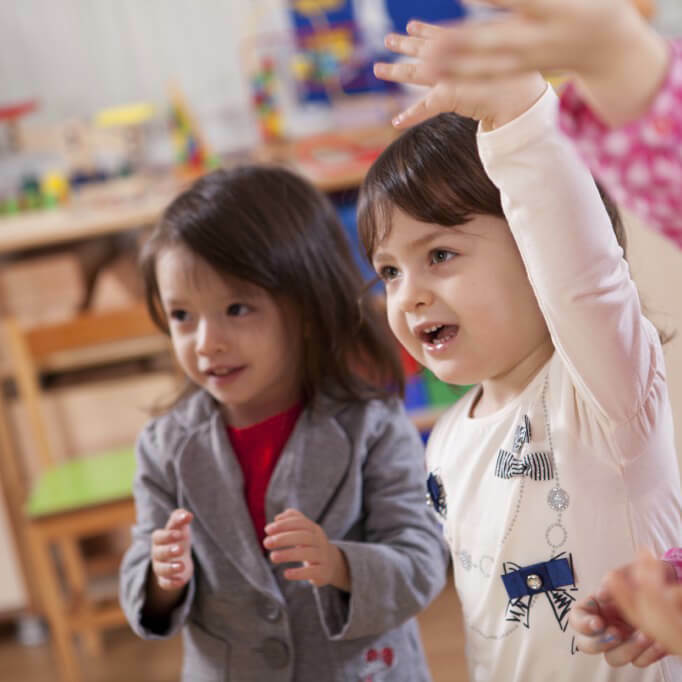 Accurately identifying behavior through ASQ:SE-2 paves the way for next steps—further assessment, specialized intervention or ongoing monitoring, for examples—to help children reach their fullest potential during their most formative early years. With the typical ups and downs of young children’s emotions and behavior, delays or problems can be easily missed. And today, as more children are increasingly exposed to risk factors such as poverty or toxic stress, the likelihood of depression, anxiety, and anti-social behavior increases. There is tremendous opportunity during the first few years of a child’s life to identify and address potential social-emotional concerns. This is at the heart of ASQ®:SE-2. It is modeled after the acclaimed ASQ®-3 and is tailored to identify and exclusively screen social and emotional behaviors. ASQ:SE-2 is an easy-to-use tool with all the advantages of ASQ-3—it’s cost-effective, parent-completed, photocopiable, and culturally sensitive. With questionnaire results, professionals can quickly recognize young children at risk for social or emotional difficulties, identify behaviors of concern to caregivers, and identify any need for further assessment. Can ASQ:SE-2 Be Used as a Developmental Screener? 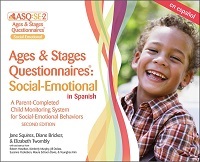 ASQ:SE-2 focuses on social and emotional behavior. To be sure that you are taking a comprehensive look at a young child’s development, use ASQ:SE-2 in conjunction with ASQ-3 or another developmental screening measure that provides information on a child’s general functioning in communication, motor, and cognitive areas. Everything you need to know about ASQ:SE-2 in one PowerPoint! Easy to understand and easy to share with colleagues. See a sample English questionnaire! See a sample Spanish questionnaire! ASQ:SE-2: How to get started. Hit the ground running with the ASQ:SE-2 Starter Kit. Program can set up efficiently with an easy-to-understand User’s Guide, photocopiable questionnaires, and Quick Start Guide. Depending on your program’s needs, you may also wish to purchase individual components such as additional User’s Guides or Quick Start Guides. That’s all you need to begin. And as ASQ:SE-2 is photocopiable—you never need to re-order the questionnaires. Depending on specific program needs, additional user’s guides, questionnaires, and Quick Start Guides are available for purchase. Learning activities and training resources also help support your screening efforts. This essential guide shows you how to work with parents to complete the questionnaires, how to score them, and how to interpret with sensitivity to children’s environmental, cultural, and developmental differences. Masters of the 9 photocopiable questionnaires and scoring sheets plus a CD-ROM with printable PDFs, in a handy box. This lightweight laminated 4-page guide keeps administration and scoring basics close at hand. Sold in sets of 5. Watch a home visitor using ASQ:SE-2 with the family of a 4-year-old boy. Need an order form? Print this form to order using a purchase order or via fax. Refined Spanish translation that was reviewed by a panel of Spanish-speaking experts in in the early childhood and communication fields. Sturdy, convenient box with handle for easy portability and updated questionnaire design to parallel ASQ-3. New family engagement materials including the What is ASQ:SE-2? handout for parents, Parent Conference sheet, and updated activities to promote family involvement. Learn about the changes and updates to ASQ:SE-2 in our webinar series. What are the areas screened? What is a sample item? From the 24 month questionnaire: Does your child let you know how he is feeling with words or gestures? For example, does he let you know when he is hungry, hurt, or tired? See a sample questionnaire. 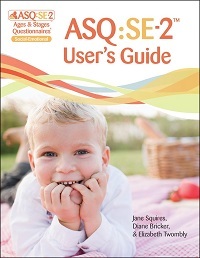 The ASQ:SE-2 Starter Kit contains everything you need to start screening children with ASQ:SE-2: 9 paper masters of the questionnaires and score sheets, a CD-ROM with printable PDFs, the ASQ:SE-2 User’s Guide, and a FREE ASQ:SE-2 Quick Start Guide. Parents/caregivers complete the questionnaires; professionals, paraprofessionals, or clerical staff score them. A questionnaire takes 10–15 minutes to complete and 1–3 minutes to score. What is the validity and reliability? Validity is 84%. Test-retest reliability is 89%. 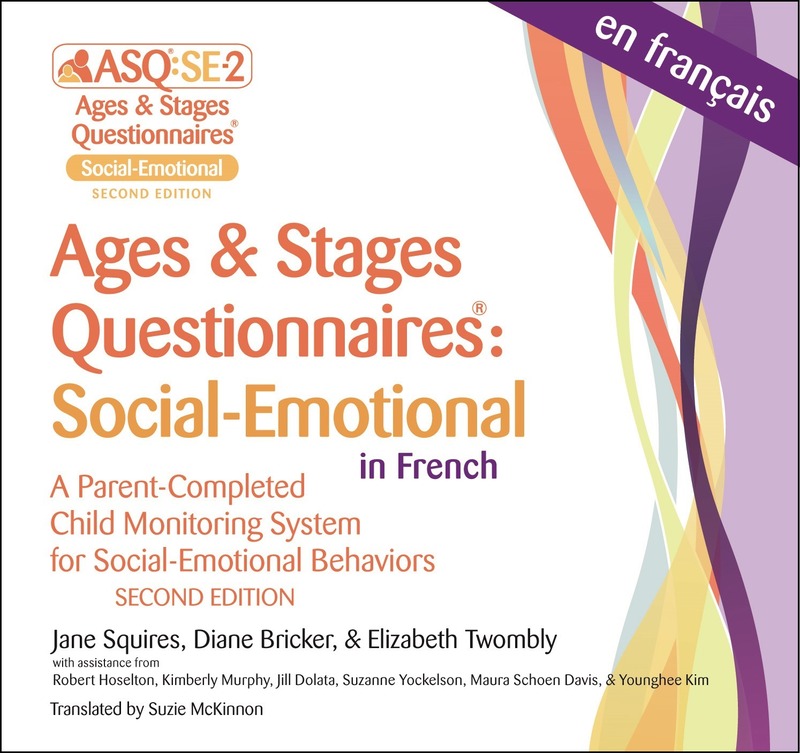 ASQ:SE-2 questionnaires are available for purchase in English, Spanish, and French. ASQ:SE (1st edition) is available in Hmong and Somali in the PTI system. See additional translations and adaptations of ASQ:SE-2. Online management is available with ASQ® Pro for single sites and ASQ® Enterprise for multi-site programs. Online questionnaire completion is available with ASQ® Family Access. Online options require the purchase of print ASQ:SE-2 questionnaires. What are additional features of ASQ:SE-2? Discover the answers the most popular ASQ:SE-2 FAQs! Have a question about ASQ:SE-2 we didn’t cover? Ask ASQ co-developer Jane Squires! Validity, reliability, and utility studies were conducted on ASQ:SE-2 between 2009 and 2011 to accurately determine the psychometric properties of the screening instrument. Normative studies included 14,074 children, ages 1 month up to 72 months. The results support the ability of ASQ:SE-2 to discriminate between children with social-emotional delays and those who appear to be developing typically in social-emotional areas. Internal consistency, measured by Cronbach’s coefficient alpha, ranged from 71%–91%, indicating strong relationships between questionnaire total scores and individual items. Test-retest reliability, measured as the agreement between two ASQ:SE questionnaires completed by parents at 1- to 3-week intervals, was 89%. These results suggest that ASQ:SE scores were stable across time intervals. Concurrent validity, as reported in percentage agreement between ASQ:SE and concurrent measures, ranged from 71% to 90%, with an overall agreement of 84%. Sensitivity, or the ability of the screening tool to identify those children with social-emotional disabilities, 78% at 2 months to 84% at 24 months, with 81% overall sensitivity. Specificity, or the ability of the screening tool to correctly identify those children without social-emotional delays, ranged from 76% at 18 months to 98% at 60 months with 83% overall specificity. Read about the extensive research behind ASQ:SE-2. Learn about the ASQ developers and the philosophy that drives them. ASQ:SE-2 has been studied extensively. Psychometric studies based on normative samples of more than 16,000 questionnaires show high reliability, internal consistency, sensitivity, and specificity. Studies consistently support ASQ:SE-2’s accuracy and ease of use, and ASQ:SE-2 has been used successfully in many early intervention and mental health programs. Below is a sampling of articles supporting ASQ:SE-2 as an accurate, cost-effective, and parent-friendly instrument for screening and monitoring of social-emotional competence in young children. Feel free to view a more comprehensive list of ASQ:SE-2 studies. McCrae, J. & Brown, S., (2017). Systematic review of social-emotional screening instruments for young children in child welfare. Research on Social Work Practice, 1-22. Baggett, K., Warlen, L., Hamilton, J. Roberts, J., & Staker, M. (2007), Screening Infant Mental Health Indicators: An Early Head Start Initiative, Infants & Young Children, 20, 4, 300-310. Bricker, D., Shoen Davis, M., & Squires, J. (2004). Mental health screening in young children. Infants and Young Children. 17(2), 129-144. Briggs, R.D., Stettler, E.M., Johnson Silver, E., Schrag, R.D.A., Nayak, M., Chinitz, S., & Racine, A.D. (2012). Social-emotional screening for infants and toddlers in primary care. Pediatrics, 129, 2, 1–8. Cooper, J., Masi, R., Vick, J. (2009). Social-emotional development in early childhood: What every policymaker should know. National Center for Children in Poverty. *Some studies are on prior editions. We look to our users to inform ASQ:SE-2’s future iterations—the educators, families, and professionals using our tools on a daily basis. To date, thousands of families and professionals have provided valuable feedback to the tool’s developers at the Early Intervention Program at the University of Oregon. As programs make the transition to ASQ:SE-2, our developers are happy to receive blind data to help further their research and the development of future editions. If your program has collected data on ASQ:SE-2 and would like to share it, email rights@brookespublishing.com. Please include your data and complete contact information, which will be shared only with the authors and not used by Brookes Publishing or any other party. See the full list of research articles on ASQ:SE.